Wisdom teeth, also known as love teeth in Korea, are third molars that can erupt at different stages of one’s life. Discover the most common age for wisdom teeth to erupt, the factors that affect their growth and the reasons why you may never get them. Ideally, one gets their wisdom teeth between the ages of 17 to 25. But, they can still erupt as late as 94 years of age! Yes, they could come in when you’re in your late teens, twenties, or even nineties. What Affects the Growth of Wisdom Teeth? Bone density. The average human jaw reaches its maximum bone density at the age of 23. Jaw growth. Third molars don’t show up until the jaw has completed its growth. On average, the jaw grows till around the age of 17-18. Level of eruption. The growth depends on the way your third molar is situated in your jawbone. If it has a normal alignment, then you will see it. Root development. The roots of wisdom teeth usually develop during teenage years. The crown of the molar could start to erupt at this period. But, if it is stuck in the bone, there might be a delay in the root development. Problems with adjacent teeth. Poor dental habits could cause tooth decay. 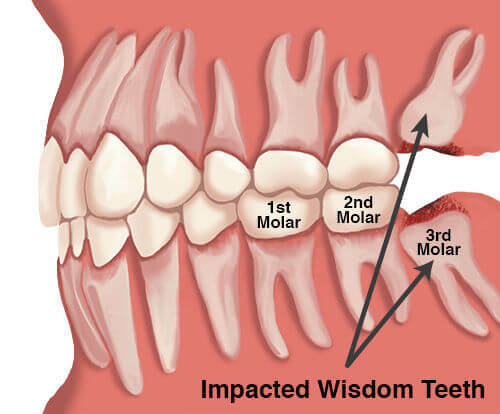 When the wisdom tooth has a large cavity it can affect the tooth next to it and vice versa. You can have up to 4 wisdom teeth that might erupt, one in each of the four quadrants. Aside from those four, some people have extras, termed as supernumerary teeth. But, not everyone has wisdom teeth. Sometimes, they don’t form nor show up. It’s congenitally absent. You never had those extra tooth buds since birth, so they won’t develop. The third molars are stuck in your jaw bone. Your dentist might ask you to take Panorex x-ray to check impacted teeth. This is one of the most common reasons why wisdom teeth don’t show up. It is usually the third molar that does not erupt. If they are impacted far back in your mouth, the dentist would recommend tooth extraction. Those teeth may not come in normally and you might experience pain, especially when they are trapped in your gums or jawbone. A tumor or cyst is preventing the molars from erupting. It is pressing against the other teeth because of a wrong angle. You have a small jaw. In such a case, there will be no space for more molars. Having wisdom teeth is a phenomenon—you can have it, or you can’t. But, when you do, practice good oral hygiene to avoid the pain and the bills associated with a decaying tooth. It’s also important to see your dentist if you notice pain or swelling in the gum area to avoid further gum or teeth damage.